Cerebral somatic oximeter is also known as regional oximeter. Cerebral oximeters provide clinicians reliable and efficient patient monitoring to help prevent adverse events. These devices are used to monitor oxygen saturation (rSO2). Neurological diseases and brain trauma such as hypoxic-ischemic encephalopathy (HIE) are caused due to less supply of oxygen to the brain. Hence, increase in incidence of cerebral hypoxia is anticipated to drive demand for cerebral oximeters. According to WHO 2015 estimates, HIE occurs in about 2 to 9 per 1,000 live births and causes significant brain damage and impairment. Increase in incidence of neurological diseases and disorders is expected to drive the global cerebral somatic oximeters market. Rise in the number of product approvals is likely to fuel the growth of the global cerebral somatic oximeters market during the forecast period. In May 2017, Masimo received FDA clearance for the pediatric indication for O3 regional oximetry with the O3 pediatric sensor. The global cerebral somatic oximeters market has been segmented based on type, clinical application, patient type and end-user. In terms of type, the market has been classified into dual emitter and dual detector, single emitter and dual detector, and others. Based on clinical application, the market has been classified into cardiac surgery, vascular surgery, and others. Based on patient type, the market is classified as NICU, pediatrics, adults. In terms of end-user, the global cerebral somatic oximeters market has been categorized into hospitals, ambulatory surgical centers, clinics, and others. Based on region, the global market has been segmented into North America, Europe, Asia Pacific, Latin America, and Middle East & Africa. In terms of type, the single emitter and dual detector segment is projected to expand at a high CAGR in the next few years. The segment is anticipated to account for major share of the market by 2026. Based on application, the cardiac surgery segment is expected to grow at a rapid pace from 2018 to 2026. Increase in patient population, rise in product approvals, and technological developments are likely to boost market growth during the forecast period. North America dominated the global cerebral somatic oximeters market in 2017, followed by Europe and Asia Pacific. Popularity of pulse oximeters and cerebral devices, increase in demand for high quality treatment, and technological advancements drive the market in these regions. Moreover, rise in prevalence of diseases, favorable reimbursement policies, increase in the geriatric population, and surge in health care expenditure are projected to propel the market in these regions during the forecast period. Asia Pacific is expected to be the most lucrative market for cerebral somatic oximeters from 2018 to 2026. Increase in disposable income, rise in population, and expansion of key players in the region are likely to boost the growth of the market in Asia Pacific. Key players operating in the global cerebral somatic oximeters market include Medtronic, Nonin Medical, CASMED, ISS, Inc., Masimo, Hamamatsu Photonics K.K., and Ornim Medical. Cerebral somatic oximeter is also known as regional oximeter. Cerebral oximeters provide clinicians a reliable and efficient patient monitoring to help prevent adverse events. These devices are used to monitor oxygen saturation (rSO2). This report analyzes the current and future prospects of the global cerebral somatic oximeters market. The report comprises an elaborate executive summary, including a market snapshot that provides overall information of various segments and sub-segments. The research is a combination of primary and secondary researches. Detailed qualitative analysis of factors responsible for driving and restraining market and opportunities has been provided in the overview section. Market revenue in terms of US$ Mn for the period between 2016 and 2026 along with the compound annual growth rate (CAGR %) from 2018 to 2026 are provided for all the segments, considering 2017 as the base year. Market related factors such as technological developments, product innovation, and expansion of infrastructural facilities by major & small major products, and historical year-on-year growth have been taken into consideration while estimating the market size. Growth rates for each segments of the global cerebral somatic oximeters market have been determined after a thorough analysis of past trends, demographics, future trends, technological developments, product development life cycle, and regulatory requirements. These factors would help the market players to take strategic decisions in order to strengthen their positions and expand their share in the global market. Based on type, the global cerebral somatic oximeters market has been classified into dual emitter and dual detector, single emitter and dual detector, and others. In terms of clinical application, the market has been categorized into cardiac surgery, vascular surgery, and others. In terms of patient type the market is classified as NICU, pediatrics, adults. Based on end-user, the global cerebral somatic oximeters market has been divided into hospitals, ambulatory surgical centers, clinics, and others. 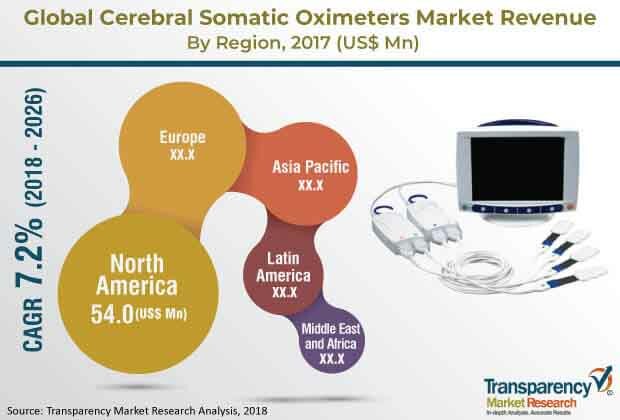 Geographically, the global cerebral somatic oximeters market has been segmented into five major regions: North America, Europe, Asia Pacific, Latin America, and Middle East & Africa. The regions have been divided into major countries/sub-regions. A global overview has been provided, and North America has been analyzed in depth at country as well as product, application, and end-user segment levels. North America includes the U.S. and Canada. Europe, Asia Pacific, Latin America, and Middle East & Africa have been briefly profiled at country level. Countries/sub-regions in these regions include the U.K., Germany, France, Italy, Spain, China, Japan, Australia & New Zealand, Brazil, Mexico, GCC Countries, and South Africa. The competition matrix section included in the report is likely to assist existing players to increase market shares and new companies to establish presence in the global cerebral somatic oximeters market. The report also profiles major players in the global market based on various attributes such as company overview, financial overview, SWOT analysis, key business strategies, product portfolio, and recent developments. Key companies profiled in the report include Medtronic, Nonin Medical, CASMED, ISS, Inc., Masimo, Hamamatsu Photonics K.K., and Ornim Medical.